Peggy Wilmoth’s childhood dream was to become an Army nurse. That dream has come true and then some. 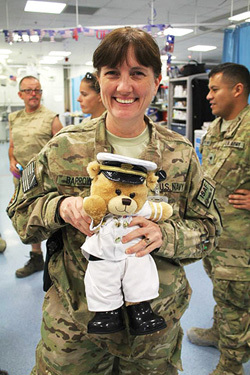 In 2015, after being confirmed by the U.S. Senate, Major General Wilmoth became the first nurse in the 106-year history of the Army Reserve to serve as Deputy Surgeon General. In this position, she advises the Army Surgeon General on the mobilization and readiness of Army Reserve medical personnel. Her Army Reserve career began 35 years ago, when she was commissioned as a captain. A highlight of her career came in 1984, when MG Wilmoth earned the Expert Field Medical badge, one of the most prestigious Army special skill badges. She did just that when her own son and daughter-in-law, both in the Army Reserve, mobilized to Iraq and Afghanistan. Since joining the Army Reserve, MG Wilmoth has juggled the demands of two full-time careers. 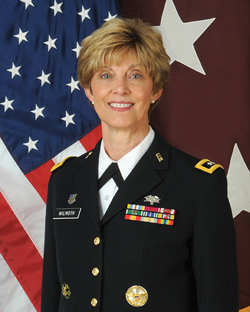 Outside of the Army Reserve, MG Wilmoth is a professor of nursing at Georgia State University, where she previously served as dean of the Byrdine F. Lewis School of Nursing and Health Professions. 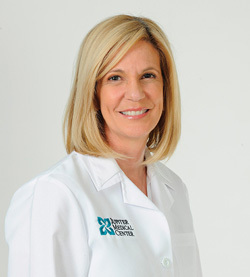 Her focus is on health policy, which she honed as a fellow in the competitive Robert Wood Johnson Foundation Health Policy Fellows program in 2009. For a year, she worked on Capitol Hill in the Office of the Speaker of the House, the Honorable Nancy Pelosi. The balancing act can be challenging, but there are two factors that keep her and other reservists motivated. As an Army officer and nurse, MG Wilmoth is also committed to good health: She counts running and yoga among her favorite hobbies. She also likes to travel, especially to North Carolina where she can see her son, Michael, daughter-in-law, Tara, and her granddaughter, Emma. Another son, John, lives in Atlanta. As a woman in the military, MG Wilmoth says her membership in DAR is especially important. “I really appreciate the love of country that bonds Daughters together,” she said. Captain William Penny Chapter, Chatham, Ill.
Nancy Taft, M.D., has always been patriotic, but it wasn’t solely a love of country that led her to the Army Reserve just 22 days before 9/11. A single mother of two and full-time nurse, she needed the extra money to help pay her medical school bills and to help send her children, Megan and Nathan, to college. A surgeon specializing in breast cancer surgery, she graduated from medical school in 2004, and was called up for her first deployment the following year. She spent four months at Fort Bliss in El Paso, Texas, filling in for active-duty doctors who were sent to the front lines in Iraq. Four years later, she deployed to the Forward Operating Base Salerno in Afghanistan, where she helped staff a combat support hospital. In 2013, she returned to Afghanistan. At Kandahar Airfield, she was part of a forward surgical team, a small, mobile unit composed of 20 medical professionals. The unit practiced hooking up supplies to a helicopter and quickly setting up a triage center upon landing, so that they would be able to perform so-called damage control surgery on wounded soldiers and civilians within 90 minutes of touching down. Dr. Taft initially committed to the Army Reserves for eight years, but she stayed on for seven more. In March 2016, after 15 years, the lieutenant colonel was honorably discharged. After serving her country, she said she has developed a deeper appreciation for her membership in the Captain William Penny DAR Chapter, Chatham, Ill. When she left the Army Reserves last spring, she also made another leap—from the Midwest, which had been home nearly her entire life, to a new job in Jupiter, Fla. The self-proclaimed workaholic said she doesn’t have much free time, but she spends it exercising, reading and visiting with family. Roger Sherman Chapter, New Milford, Conn.
Military service is a family tradition for Jeanette Barrows. As a member of the Roger Sherman Chapter, New Milford, Conn., she’s undoubtedly proud of her Patriot, Zadoch Noble. But the eight generations after him have also served, including Ms. Barrows. Ms. Barrows is a Hospital Corpsman First Class in the U.S. Navy Reserve. She enlisted in 2000 after receiving her paramedic’s license—and a letter from the Navy expressing interest in her joining. In 2014, Ms. Barrows deployed to the Kandahar Airfield in Afghanistan for seven months. She served as the lead petty officer for the 12-bed trauma bay, which treated serious casualties. On one occasion, after a nearby medical clinic was bombed, the trauma bay treated 50 patients in the span of four hours. “But that was a rarity,” she said. “Every day was not like that.” In fact, many of the injuries Ms. Barrows saw in the hospital were construction-related. When she wasn’t working 24-hour shifts, Ms. Barrows spent a lot of time on her own. “I was there during the drawdown, so there wasn’t much to do in terms of entertainment,” she said. Luckily, Internet service had improved, so she could Skype almost daily with her family. When she returned home, she resumed her job at the Girl Scouts of Connecticut managing the organization’s adventure programs, such as archery, canoeing, kayaking, snowshoeing and cross-country skiing. “It’s so rewarding to see girls get outside and do the things that challenge them to be stronger and grow into smart, self-reliant young women,” she said. Using her skills as a paramedic, Ms. Barrows volunteers as an EMT and teaches first aid and CPR in her community. She’s also a member of her local garden club.